I used to hate blocking, but I think I have come full circle on it and may even enjoy it, although it may be the project that I am working on. There are few things more fun than seeing heavily cabled pattern blocked out. 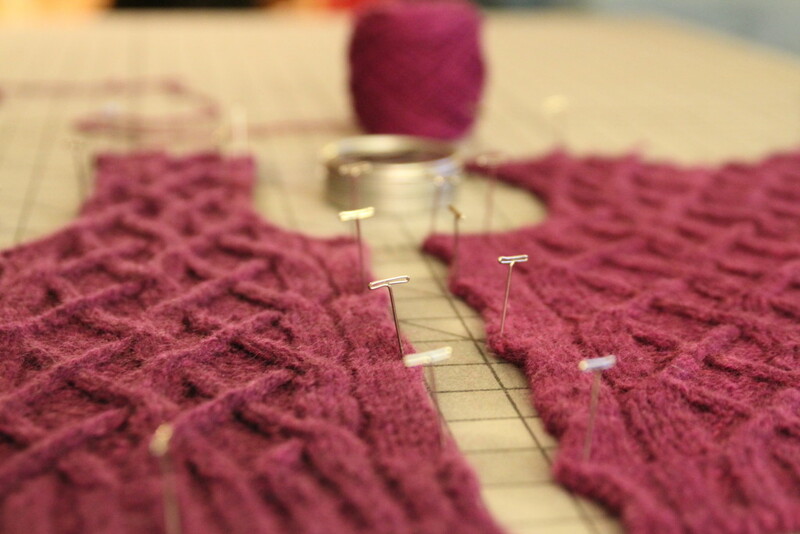 I am working on my Arlo and was on the fence about where the armholes were on the pieces, so I decided to block out the individual pieces while I am working on it to make sure that everything will line up. In other news the needles haven’t been so kind to me in regards to my other projects. I frogged my whole triangle scarf (a shop pattern from Churchmouse Yarns & Teas) in Alchemy’s Silk Purse (I have started this again). On my Freshly Fallen which seems to be going well I hit a small roadblock when I realized that I didn’t alternate the dot placement so I will have to hear out the last 3 rows. Arghhhhh.. Sometimes is just feels like one never gains any traction on their projects.